"Praise — there was nothing but praise." We work in tandem with our clients' teams to upgrade the existing menus, modernize presentations and evaluate ingredients. We write and present new menu outlines that include regional specialties, sensitivity to seasonality and are appropriate for the concept of each individual restaurant and then present the outline to our client. When approved, we develop the complete menu and work out the end-to-end details from menu wording and presentation to developing and testing the recipes. Next, we create the policies and procedures for the staff to follow regarding each dish. Each menu will dovetail with the overall mission statement for each company’s culinary product and will be completely demonstrated and documented for the staff. To enhance the entire culinary delivery approach, we evaluate the entire back-of-house structure, from the equipment itself, to its location and the positioning and responsibility of each chef and server. We will give a full presentation of our recommendations with a complete business case for each element. Moving forward, we create flowcharts detailing responsibility which will provide a measure of accountability. 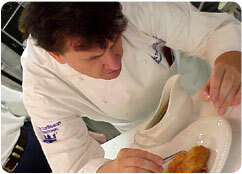 We work with our clients’ crews to provide a seamless integration between cooking staff and serving teams. We work with our clients’ HR department and the key f&b supervisors for all culinary hiring efforts during the term of the contract as well as design culinary staff reorganizations and provide HR with documents detailing all procedures, standards, and performance expectations. (Your Name) thought you would like to see this page from the Food, Hospitality and Restaurant Consulting | Master Chef Rudi Sodamin and Food Sensation Enterprises web site.